The latest of Lincoln Rhyme’s fiendishly inventive antagonists is a killer who rails against rampant consumerism online, then hacks into the Internet of Things to murder New Yorkers who’ve grown too attached to their computer-driven toys. Following a spotting of the perp dubbed Unsub 40 in a crowded shopping center, the NYPD’s Amelia Sachs is at the point of apprehending him when a calamitous escalator accident claims her attention and bystander Greg Frommer’s life. Unsub 40 escapes to plot further sabotage of the microchips that regulate the behavior of common household and industrial devices that might otherwise turn nightmarishly lethal—though he’d be even happier with the kind of hands-on violence that allowed him to swing a ball-peen hammer or wield a razor-sharp saw. Amelia directs Frommer’s destitute widow, Sandy, to attorney Evers Whitmore and quadriplegic criminalist Lincoln Rhyme (The Skin Collector, 2014, etc. ), who’s now left criminal investigation to teach forensics and concentrate on civil cases, for their help in preparing a liability lawsuit against—well, against anyone they can find with plausible liability and substantial assets. For a while, it looks as if Amelia and Rhyme, her sometime lover, will be competing for expert help and resources. But their two cases predictably join together, freeing them to focus together on what they do best: turning over every clod of dirt in the Big Apple in search of Unsub 40, who continues, through a combination of cunning and uncanny good luck, to elude them. 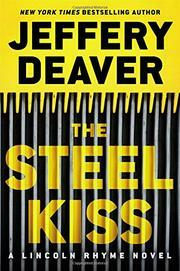 Deaver, evidently worried that he hasn’t provided a generous enough banquet of felonies, interleaves a couple of complementary cases for Rhyme and Amelia’s associates, but these are both subpar and distracting, though they do allow another of his patented multistage, 60-page denouements, though this time with gradually diminishing returns. Fans savvy enough to ignore the ill-advised extras and keep their eyes on the duel between Rhyme and Unsub 40 will be treated to all the usual thrills, which are worth every breathless minute.